I grew up baking with Mom and Grandmother. We were the family that handed out home-made sweet breads, pies and dozens of different kinds of cookies to friends, family, and my parents’ co-workers. Our holiday baking sessions were more like missions. It was days and days, and days and days, of mixing, rolling, cutting, and assembling. (It was also the one time of year that I was allowed to stay up past mid-night.) During these marathon bake-offs my mom would simmer hot apple cider on the stove with fresh cloves, cinnamon sticks and orange rinds. We were not allowed to drink soda growing up so apple cider was a serious treat for me… and how I loved apple cider! Every single day I make myself a smoothie bowl after my morning workout. 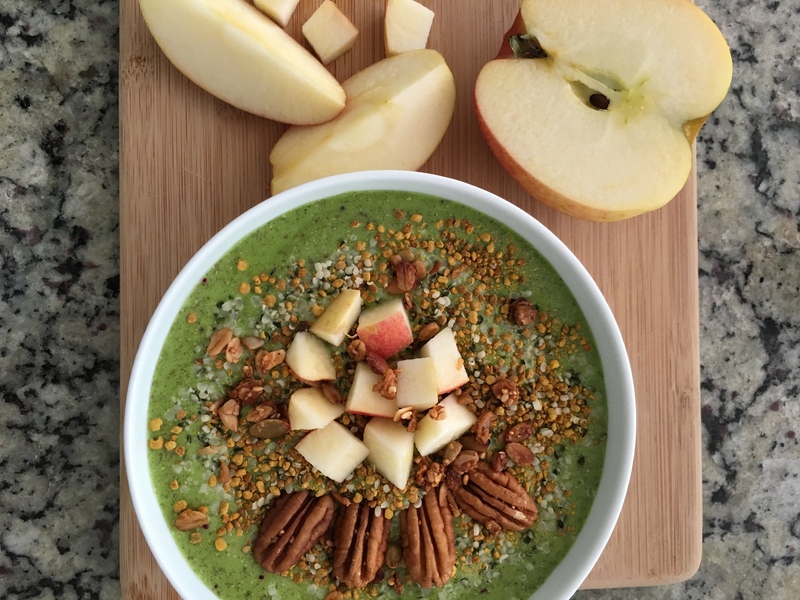 I LOVE SMOOTHIE BOWLS – I am not quite sure how I lived my first 40 years without them. Now while most smoothie bowls you see on Pinterest or Instagram are filled with bananas and exotic fruits, mine are a little less colorful* but still full of flavor and, more importantly, nutrition. *My body does not process fructose very well, so I limit the amount of fruit that I eat. Water/ice – Not as much water as you would for a smoothie drink. 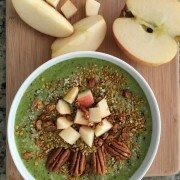 Top with: Hemp hearts, cinnamon, chopped apples, pecans, granola, bee pollen, etc. It appears that baked oatmeal is making a comeback. I usually don’t keep oats around, but do have quinoa flakes in my pantry. I adapted a couple recipes and came up with this one using, you guessed it, Hot Apple Cider tea bags! It is super yummy. I like to drizzle more coconut milk and maple syrup on top before serving! optional – 1/2 cup chopped apples. Mix dry ingredients. Add wet ingredients. Place in oven safe dish. Top with more nuts if desired. Bake 350 for 30 minutes. Do not overbake. Drizzle with more maple syrup and coconut milk before serving. Enjoy!